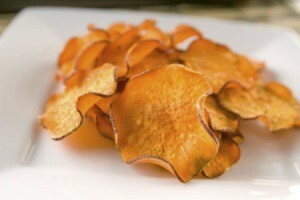 If you like potato chips, give sweet potato chips a try for a delicious variation on this popular snack. This page contains sweet potato chip recipes. If you are looking for a healthy alternative to potato chips, try making these at home. They are great with your sandwich or burger. Preheat the oven to 450 degrees F. Peel sweet potatoes and slice as thinly as possible. Toss with 2 Tbsp. of olive oil and spread in a thin layer on a cookie sheet. Sprinkle with salt, pepper, and paprika. Bake about 20 minutes or until crispy. Makes 4 servings. Can do the same with yams which are different from sweet potatoes, plantain, any food that grows from a tuber. Fish sauce is a better option and certainly more thrifty than olive oil. I've also found that 3 - 5 minutes in the microwave works better than 20 minutes in the oven.